Team Reynolds… this husband/wife team, Jerry and Patricia, love what they do and have an unending supply of energy and enthusiasm. 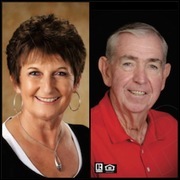 Having a combined total of 74 years in education, they know first hand, the importance of honesty, knowledge, organization, and integrity and bring these qualities to their buyers and sellers. Jerry and Patricia are graduates of Texas Tech and have spent all of their lives in the South Plains area. They are members of the Texas Tech Alumni Association, The Red Raider Club, Lubbock Association of Realtors, the National Relators Association, Texas Retired Teachers Association, Texas High School Coaches and Coached Wives Association, and Jerry, a member of the Double T Varsity Club. They are active members of the Wolfforth United Methodist Church. They pride themselves in the connections they have with former students and athletes, as well as the great people in the Lubbock and West Texas area. Their pride and joys are their family. They have a son, Chad Reynolds, baseball coach at Frenship High School, wife Heather, Executive Advisor at Marsh & McLennan Agency, and of course the most important family members, grandchildren, Weston and Halley.